DRIVEWAY & GARAGE! 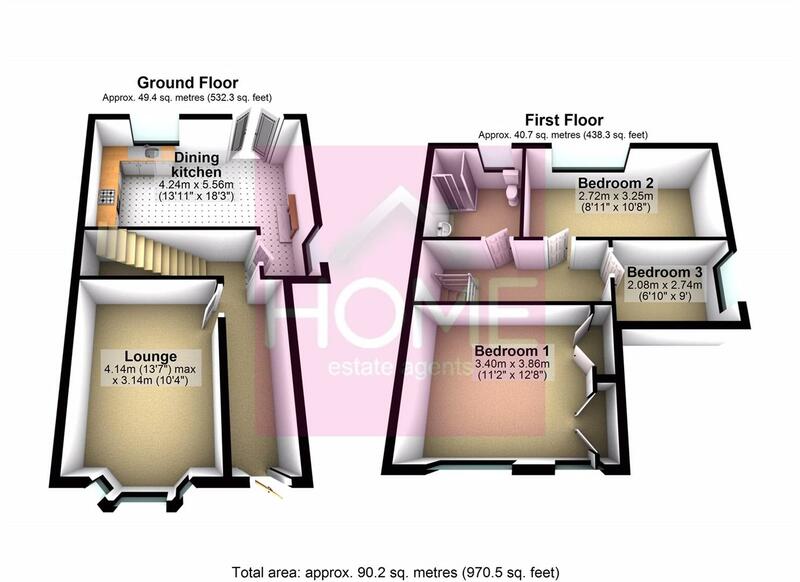 HOME ESTATE AGENTS are proud to offer for sale this three bedroom bay fronted end terrace ideally situated to enjoy the ever growing amenities of the area. Unusually for a period property this spacious property benefits from a driveway for off road parking & a garage. In brief the accommodation comprises hallway, bay fronted lounge, open plan dining kitchen, shaped landing, the three well proportioned bedrooms & a three piece shower room. The property is warmed by gas central heating & is fully uPVC double glazed. Externally to the front there is a walled palisade whilst to the rear there is a mainly paved ornate garden which is fenced for privacy. To book your viewing call HOME on 01617471177.
uPVC double glazed stained and leaded door to the front and radiator. Original coved ceiling, wooden effect floor and stairs to the first floor. uPVC double glazed bay window to the front, radiator, television point, wall lights and original coved ceiling. Feature fire surround with marble back and heath housing a living flame gas fire. uPVC double glazed windows to the side and the rear. uPVC double glazed French doors leading to the rear garden. A marble fire surround and hearth housing a living flame gas fire. A comprehensive range of matching wall and base units with a marble worktop over. A one and a half unit sink with mixer tap. Integrated fridge freezer, four ring gas hob, double oven and extractor fan. Space for other appliances. Worcester gas central heating boiler, wooden effect floor and understairs storage. Closed balustrade and loft access. The loft is accessed via a pull down ladder and is partially boarded for storage. Two uPVC double glazed windows to the front and radiator. Fitted headboard, bedside cabinets and overbed storage with feature lighting. Fitted wardrobes with ample hanging and shelving space. Fitted dresser and drawers. uPVC double glazed window to the rear and radiator. A built in wardrobe with hanging and shelving space. uPVC double glazed window to the side and radiator. A three piece suite comprises low level WC, vanity wash hand basin and large shower cubicle. Tiling to compliment, tiled floor, ladder radiator, underfloor heating and spotlights. uPVC double glazed opaque window to the rear. A detached garage with up and over door to the front. Door to the side for access. To the front of the property there is walled palisade and pathway to the front door. There is a driveway providing ample off road parking which leads to the garage. To the rear is is mainly paved for low maintenance and there is a wooden decked patio. There is also an outside tap. We have been advised by our clients that the property is Leasehold with an annual ground of £5.00 per year payable.